The Walking Dead Season 4 is really progressing well as evidenced by the very first look on the set of the show released by AMC. 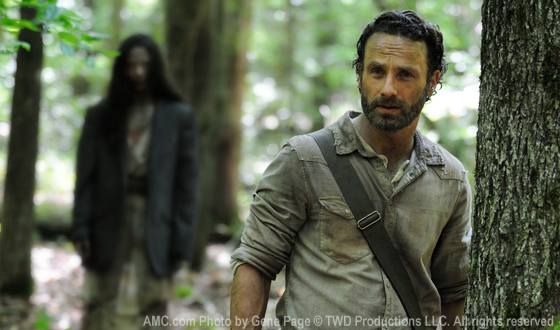 The photo, which debuted on the networks blog, features the ever-haggard Rick Grimes played by Andrew Lincoln, who is back on set in Atlanta, GA. The TV adaptation of the comic book series of the same title, created and written by Robert Kirkman, still proves its very strong pull on millions of viewers. That is the very reason why The Walking Dead Season 4 returns to AMC this year, premiering on October. Here's the first official look on The Walking Dead Season 4. Many of you might recall that on December 21, 2012 the show has officially renewed for the fourth season. Then starting last May 6 this year the show started its production. Just like the third season, this one will have a running of 16 episodes. AMC has given us the sneak peek of the Zombie School for the Fourth Season, where the extras are training to be hair-raising zombies. The Governor, played by David Morrissey, is back to torment our beloved characters. New characters will come along the way, but one new and confirmed regular casting for the show was that of Bob Stookey to be portrayed by Lawrence Gilliard Jr. You can read more about this casting here. Aside from The Governor, a few recurring characters have been elevated as series regulars such as Tyrese played by Chad Coleman, Sasha played by Sonequa Martin-Green and Emily Kinney's lovely Beth. Karen, who is portrayed by Melissa Ponzio, is set as a recurring guest star. Have an early Halloween on October with AMC's The Walking Dead Season 4.